Remember when owning the "Land Yacht" was considered a good thing? We all know that fuel efficiency and ease of parking seem to dictate that "Smaller is Better". Except in the world of RV and pleasure boating... where the opposite still holds true - Bigger is Better, and this isn't going to change anytime soon. 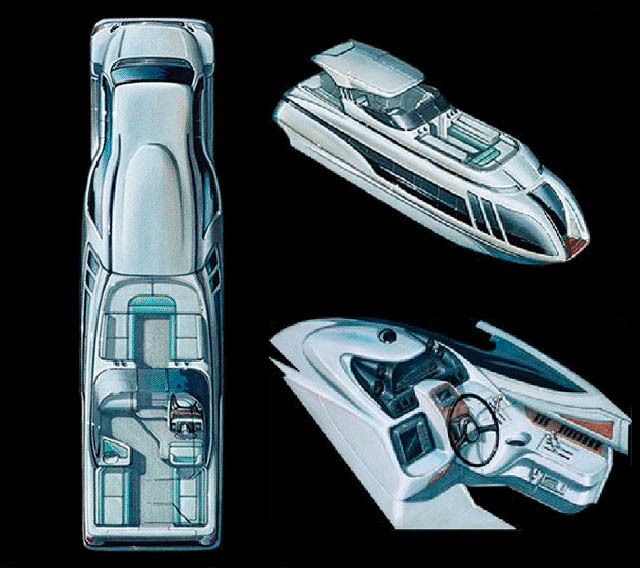 In fact, imagine blending two concepts together - pleasure boat and recreational vehicle - and you get a mammoth, beautiful thing that is just as spectacular to look at as it's convenient and practical in unlimited luxury travel. In the past the only way you were able to enjoy water and land travel in one package was to purchase a motorhome and tow a cruiser. Now you can enjoy the ultimate flexibility in land and water travel with this crazy combo of 2009 GMC Kodiac Duramax 6500 truck cab and chassis - and a "Boater Home" house boat. It's an RV! It's a House Boat! It's the Ultimate Lifestyle Vehicle! Here are the impressive size specs: higher! (11'-9.5"), longer! (44'-9.5"), wider! (8'-9.5"), with weight (26000 GVW) - all providing for a better stability. - no more trying to haul 80 feet in length on a highway: hence ease of maneuvering, parking and backing up. This carbon fiber luxury motor home / house boat combination will give you the best of both worlds - and incidentally should also be used in the movies, like Iron Man, Transformers, Terminator, etc. With its unique concept, the attraction is ideal for the entertainment industry. 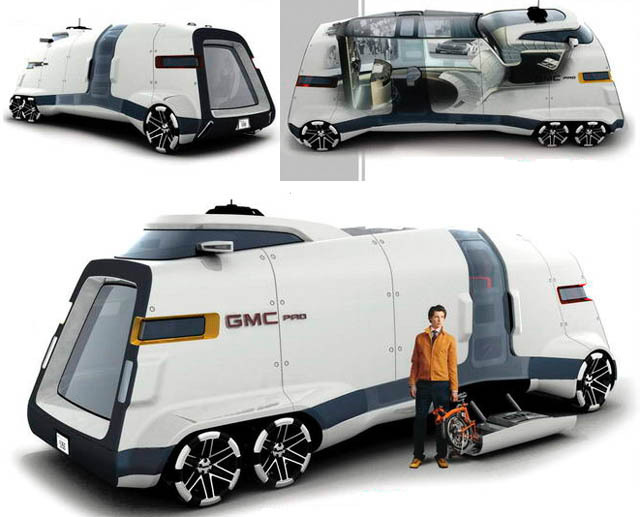 This concept perhaps isn't new, but it's only in a few recent years that the seemingly-obvious idea of making a modular land and water-based RV has seen any hopes of production and further development. 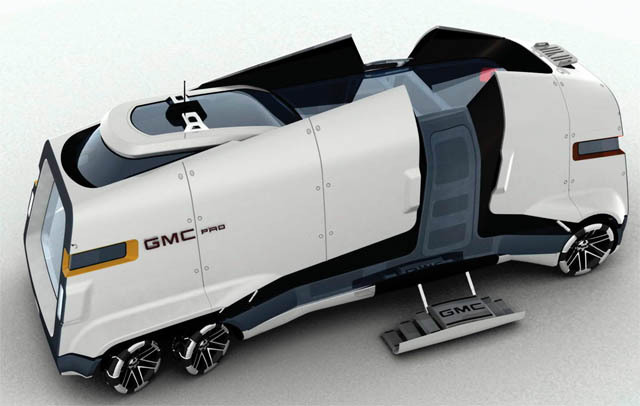 You might remember the gorgeous PAD Vehicle RV concept presented a few years back. It was so cool looking that most people just had to sigh with that forlorn look in their eyes: "Oh, I wish I could travel in this thing if only for a day..."
Regardless of the fate of this concept, or if it goes into production, we certainly enjoy the wild audacity of the idea, and wishing the best for the inventor's next round of financing and further development. After all, it is one thing to be called a "King of the Road", another to be known as "Lord of the High Seas" - and yet quite another thing to be known as BOTH and own the road, seas (and eventually, the sky) with this mammoth vehicle, in "one fell swoop". There was a commercially built unit similar to this concept for sale on Hemmings Motor News this past month. It appear to be a Ford van with a boat carried in the extended rear portion. Sticking a boat on the back of an extended van isn't a new idea. wow, very cool! is there any video footage of it actually in action? 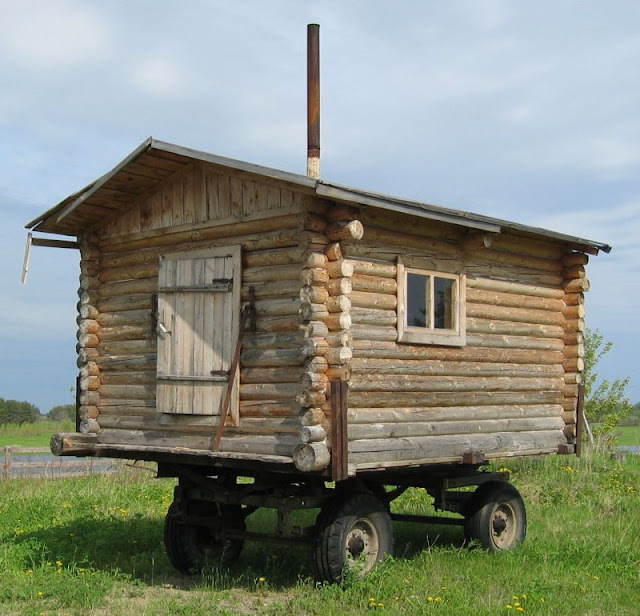 The last one is a mobile sauna. There are also mobile saunas on a raft. Related are the small sled huts ice fishers use to keep warm, and the Victorian bath wagons where the ladies could be driven into the sea to bathe in complete privacy. At least that way they were allowed to take a bath in the sea without making a scandal.